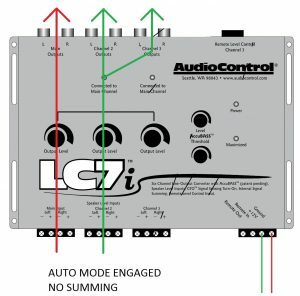 Automode is function on our multi-channel line converters that allows the user to send 4 inputs into the converter, and get 6 outputs. When Automode is engaged, it will automatically take the input of Channel 2 and send it to the Channel 3 output. Automode becomes inactive if the converter sees a signal on the channel 3 input. Typically this function is used to generate a separate sub channel when none is present. Here is a diagram showing the routing when Automode is engaged.